20 Wedding Dresses for men in India which are totally in now! Wedding dresses for men somewhat take a backseat when it comes to wedding shopping, and I don’t blame it on the groom since he is busy helping his bride shopping for the best lehenga and jewellery! 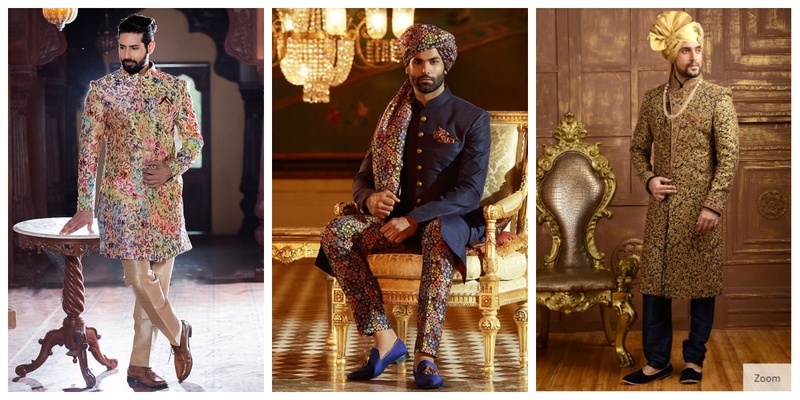 But to help all you desi grooms choose the best wedding dresses for men, I have curated a list of 20 Indian wedding dresses and suits for men that you can take inspiration from! If you are looking for stylish marriage dresses for men, then this dapper bandhgala with printed trousers and matching safa is just perfect for you. Pick a pair of Jodhpuri shoes to complete the look. Keep it minimal and stylish on your big day with this classic gold and white sherwani. If you want to amp up the look of this Indian wedding dress for men, then carry a golden dupatta or simply wear a pearl necklace! Maroon and gold is a classic combination. If you aren’t too picky about your wedding look and want to stick to a traditional style then such kind of wedding dresses for men are perfect for you. Nothing beats the beauty of a gold embroidered sherwani when it comes to mens wear for marriage. Pair this outfit with a contrasting safa and some elegant jewellery to complete your wedding look. If you are a man of classic taste and want something that’s simple yet traditional for your wedding, then this red and ivory sherwani from Manyavar is just the right pick for you. Teaming it with a matching safa and dupatta makes it look like the perfect wedding dress for men. Go dapper on your wedding day in this gold and sea green kurta, Nehru jacket and dhoti combo. Easily one of the best wedding dresses for men, this combination is comfortable, easy to carry and can be accessorized in a hundred different ways! If you too have a quirky dressing style like Ranveer, then an embroidered sherwani with skirt hem and trousers is something you will definitely like! Add a contrasting safa to this Indian wedding dress for men and you are ready to get on that ghodi for your baarat! Whoever said only women look good in florals! Look at these dapper guys rocking a designer wedding suit for men by Sabyasachi. The multicolour floral kurtas with bright Nehru jackets are perfect to wear for a spring-summer daytime wedding. Match these with beautiful printed safas and you are good to go! Give a slight twist to your classic sherwani by adding a fun drape element at the hem. Not only does this Indian wedding dress for men look modern and chic, but has a hatke look too! This wedding dress for men is an ideal choice to wear for one of your pre-wedding functions like sangeet or haldi. The simple pink kurta paired with a white Nehru jacket looks dapper, to say the least. Here’s another simple wedding dress for men with a grey kurta and floral Nehru jacket that can be worn for a daytime haldi or mehendi event. A floral print sherwani in colours like green or yellow is one of the best wedding dresses for men to wear for a daytime summer wedding. Pairing it with a matching safa and some jewellery will take the look to a whole new level. Can’t pick a colour for your wedding sherwani? Take it all together and make yourself a multi-colour sherwani like this one that looks chic and stylish at one! This wedding dress for men right here is apt to wear for a pre-wedding function like sangeet or mehndi party. The simplicity of this kurta-pyjama and Nehru jacket combo makes it look all the more elegant. A floral embroidered bandhgala jacket over a white kurta-pyjama is the ultimate stylish designer wedding suit that you can wear on your big day. This designer bandhgala by Raghavendra Rathore is an elegant choice as a wedding reception dress for men. Is there anything more pristine than a simple ivory-coloured sherwani a wedding dress for men? Choose something simple like this for your pheras and accessorize it with a brooch, pocket square, jewellery or safa as per your style! If you are looking for a wedding dress for men online, then do check out this simple gold sherwani that you can wear on your big day! Yet another simple wedding reception dress for men, this Jodhpuri suit is as classic as it gets! So, which of these wedding dresses for men did you like the most?